Huddled beneath the stairwell, I could hear rain pounding outside as my heart beat its way out of my chest. It was nearly pitch-black inside the radio tower, and somebody else was in there with me. I knew I had only one chance. My trap set, all I could do was wait, trusty frying pan in hand. That story, which I will get back to in a moment, pretty much sums up my experience so far with Steam’s latest top-seller, Playerunknown’s Battlegrounds (which they write as PLAYERUNKNOWN’S BATTLEGROUNDS, because nothing makes a crappy game name better like screaming it into people’s eyeballs). It’s a battle royale game in the style of H1Z1: King of the Kill, which is to say it’s very nearly the same game, structurally. For those who haven’t been following along with this increasingly huge sub-genre, it’s basically PVP-focused survival... without the survival elements. You parachute onto a massive map, find weapons scattered in buildings and other structures, and hunt down other players. If you die once, you’re done for good. Your goal is to be the last person standing. Out of 100. That happens very rarely. Good luck. So anyway, my story. It began with me deciding, for one match, to throw my generally methodical play-style (parachute to someplace other people probably won’t go, arm myself to the teeth, sneak to the main play area, immediately get shot by someone even more methodical and prepared than me, raise an angry first to the heavens IRL, get struck by lighting) and go Rambo from the get-go. One of the cool things about PUBG as compared to H1z1 is, you fly in on a plane and get to choose where on the map you leap out. This adds an extra layer of strategy to the experience. I saw some people aim for a radio tower and decided to follow them. And I mean really follow them. I stuck to one guy like glue. As we neared the ground, however, he managed to land on a balcony on the second floor, while I landed just outside the tower on the first floor. Realizing that he got the high ground and could probably, within seconds, find a gun on the ground, I sprinted inside. I didn’t have long, I figured, so I fumbled around in the dark for something, anything I could use to defend myself. It would have to do. I considered running up the stairs, but that’d give my enemy the advantage. Instead, I crouched beneath the stairwell and waited. I could hear him clomping around upstairs, but I couldn’t tell if he was approaching or not. That’s when I noticed: there was a rifle in the middle of the room, within perfect viewing distance of the stairs. My first instinct was to run and grab it, but then a light gust of wind hit the windmill in my brain, and I hatched a plan. I would leave the gun there as bait, then sneak up behind the guy as he tried to pick it up and wang him with my frying pan. It was fool-proof! I clenched my fists. I ground my teeth. I watched. I waited. Seconds ticked by like eternities. The moment was truly terrifying, far more so than encounters in most shooters. One of us would walk out of that radio tower, and the other would be out of the game before it even really began. Finally, he descended the stairs. He didn’t see me! My plan was working. He made a move toward the gun, and just like that, I was on him with cold (frying pan) steel. One hit, two hits... three hits? Maybe? The attack animations were awkwardly timed. It was tough to tell if my hits were actually landing. Then he tried to run up the stairs, and my character got stuck on the stair railing. Finally, he managed to shoot me a couple times, and I died. None of it felt good. Battle royale games are notorious for being janky compared to most modern shooters, and while PUBG does feel better and more precise than, say, H1Z1, movement is still kinda sludgy and uncomfortable. On top of that, the game is in Early Access, and its performance is unpredictable at best. My framerate was all over the place, which made it hard to feel like I could reliably aim and time my shots. The view from inside my wilderness hut. In other matches, I tried other strategies, typically involving guns instead of frying pans. I sniped people from atop buildings using guns I’d modified (another tactical feature games like H1Z1 don’t have), I tried (unsuccessfully) to bully my way through populated city areas, and I attempted to wait out a match in a secluded but cozy hut in the wilderness, only for someone to sneak up and blast me out of my recliner when there were about 30 people left. Some of my strategies were more successful than others. I even managed to kill a few dudes! The most memorable moment, though, was definitely the frying pan showdown. 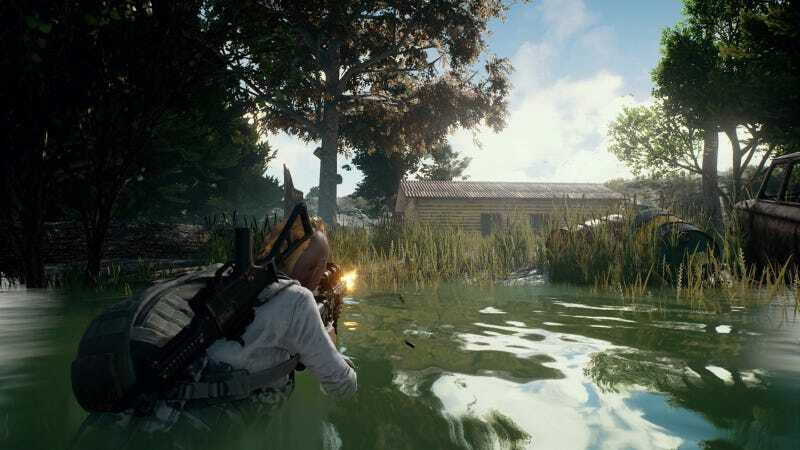 It was tense and terrifying, but marred by an unsatisfying conclusion due to PUBG’s early state and the general jankiness of the genre. I’ll probably go back to the game a bit more this weekend, but I doubt I’ll really dive into it until after it’s had a bit more time in the oven.